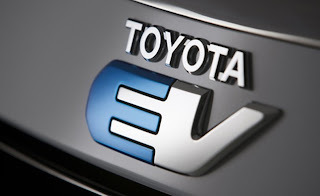 Toyota aims to commercialize solid-state batteries around 2020 and lithium air batteries several years later, as successors to today's lithium ion batteries. The solid-state batteries will be three or four times more powerful than lithium ion batteries, while lithium air will achieve a fivefold increase in output for the same weight. Both technologies have advantages over the lithium ion and nickel-metal hydride batteries used in hybrid and electric vehicles. They are smaller, use fewer costly materials such as rare earths and have lower internal resistance. Toyota unveiled a prototype of its all-solid-state battery in Japan in 2010. In solid-state batteries, engineers replace the liquid electrolyte used in lithium ion batteries with a solid one. The positive electrode, negative electrode and solid electrolyte of the prototyped cell are made by using lithium cobalt dioxide (LiCoO2), graphite and sulfide, respectively. That makes the battery more compact and more stable, allowing a higher voltage to be packed into a smaller package, Shigeki Suzuki, managing officer for material engineering said. In lithium air batteries, the lithium cathode used in lithium ion batteries is replaced with one that interacts with oxygen. This requires less material and allows for lighter packaging. They have much higher energy density than current batteries. "Next-generation battery cells need to exceed the energy density in lithium ion batteries significantly," Suzuki said. "We've been accelerating our development of those next-generation batteries technologies since 2010."